From the Department of Neurology (D.T.J., R.A.T., J.G.-R., H.B., D.S.K., R.C.P., B.F.B.) and Department of Radiology (D.T.J., C.R.J., V.J.L. ), Mayo Clinic, Rochester, MN. Objective To study the in vivo binding properties of 18F-AV-1451 (tau-PET) and Pittsburgh compound B (PiB-PET) in a unique kindred with a familial prion disorder known to produce amyloid plaques composed of prion protein alongside Alzheimer disease (AD)–like tau tangles. Methods A case series of 4 symptomatic family members with the 12-octapeptide repeat insertion in the PRNP gene were imaged with 3T MRI, PiB-PET, and tau-PET in their fourth decade of life. Results There was significant neocortical uptake of the tau-PET tracer in all 4 familial prion cases. However, PiB-PET images did not demonstrate abnormally elevated signal in neocortical or cerebellar regions for any of the patients. Conclusions In vivo detection of molecular hallmarks of neurodegenerative diseases will be a prerequisite to well-conducted therapeutic trials. Understanding the in vivo behavior of these PET biomarkers in the setting of various neurodegenerative processes is imperative to their proper use in such trials and for research studies focused on the basic neurobiology of neurodegeneration. This study supports the high specificity of neocortical 18F-AV-1451 binding to AD-like tau and the lack of PiB binding to PrP plaques. It is uncertain how early in the disease course tau pathology appears in the brains of individuals who carry this PRNP gene mutation or how it evolves throughout the disease course, but future longitudinal 18F-AV-1451 imaging of symptomatic and asymptomatic individuals in this kindred will help address these uncertainties. Pittsburgh compound B (PiB) is a derivative of thioflavin.9 Therefore, it is possible that PiB-PET could bind PrP plaques in this prion kindred. The cerebellar predominance of PrP plaques is distinct from the neocortical NFTs, allowing these aggregates to be differentiated spatially in vivo. In this study, we report the tau-PET and PiB-PET binding patterns in this kindred that has both tau aggregates and PrP plaques. All participants or their designees provided written informed consent with approval of the Mayo Clinic Foundation and Olmsted Medical Center Institutional Review boards. Participants were part of the Mayo Clinic AD Research Center in Rochester, Minnesota. Four symptomatic family members of the 12-octapeptide repeat insertion kindred were imaged with 3T MRI, amyloid-PET with (PiB-PET),9 and AV-1451 (tau-PET)8 in their fourth decade of life. These patients were all symptomatic for 1–6 years and had a behavioral variant FTD-like presentation with minimal parkinsonism. Case 1 also had a prominent nonfluent aphasia. Detailed demographic information is not relevant to the objective of this study and may allow for patient identification. Therefore, we do not report additional metadata that can be linked to the cases. One patient with young-onset AD was also evaluated for comparison purposes. Given the potential for on-target PET tracer uptake in the cerebellum, which is commonly used as a reference region for quantification, we used visual assessment as the gold standard without normalizing signal intensity to a reference region. Once we verified that there was no regional cerebellar signal on either PET modality, we created intensity-normalized images using the gray matter in the cerebellar crus for display purposes only. The datasets analyzed in the current study are not publicly available due to restricted access, but further information about the datasets are available from the corresponding author on reasonable request. There was significant neocortical uptake of the tau-PET tracer in all 4 familial prion cases (figure 1, left). 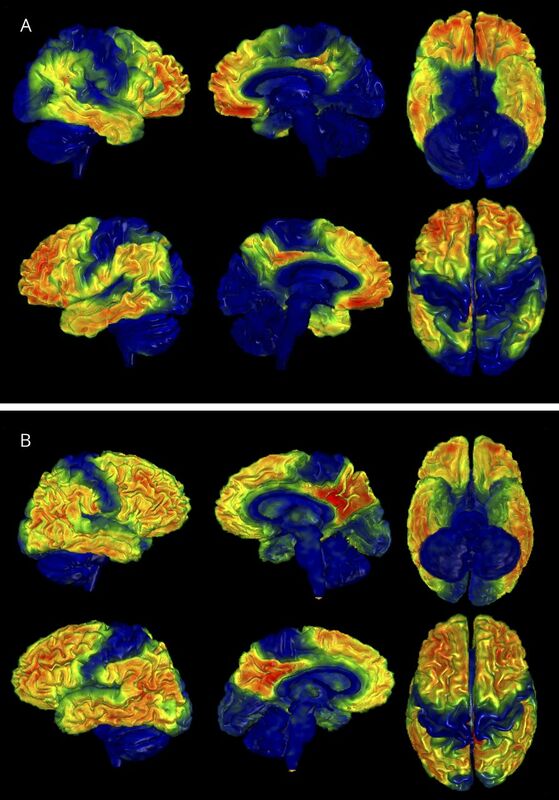 However, PiB-PET images did not demonstrate abnormally elevated signal in neocortical regions for any of the patients (figure 1, right). There was no abnormally elevated signal in the cerebellum on either PET modality. The global distribution of the elevated tau-PET signal (figure 2A) matched the known distribution of NFT in AD (figure 2B) in that the homotypic isocortex was severely affected with a stark sparing of the idiotypic cortex. However, there did seem to be relatively greater involvement of the frontal lobe compared with the precuneus in the familial prion participant. Each row displays 3 orthogonal slices of the participant's tau-PET image (left) and the same 3 orthogonal slices of the participant's PiB-PET image (right). The standard uptake value ratio magnitude is encoded in the color map and associated color bar. The clinical dementia rating scale sum of boxes (CDR-SOB) score for each patient is displayed on the far left of each row. PiB = Pittsburgh compound B. The tau-PET signal intensity is overlaid on the patient's own brain MRI rendering using MRIcroGL (nitrc.org/projects/mricrogl). 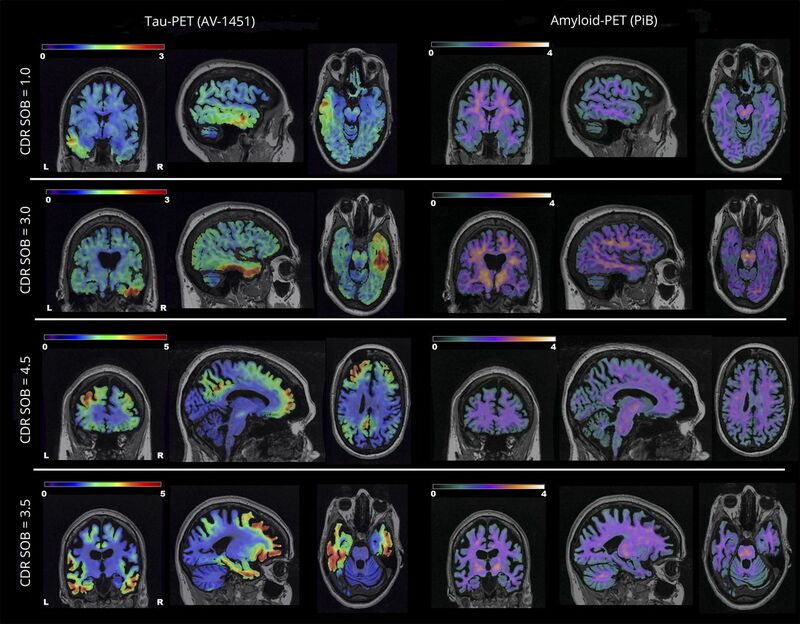 (A) The tau-PET imaging data from the familial prion participant in the bottom row of figure 1 is displayed. (B) The tau-PET imaging data from a patient with young-onset Alzheimer disease is displayed for comparison purposes. Four members of the 12-octapeptide repeat insertion in the PRNP gene kindred did not have any abnormally elevated PiB-PET signal. The fact that no elevated in vivo PiB-PET signal was seen in a kindred known to harbor amyloid plaques composed of PrP suggests that PiB-PET may be specific for amyloid plaques composed of beta-amyloid. In the absence of pathologic confirmation, an alternative explanation would be that no PrP amyloid plaques were present at this stage of the disease. This seems unlikely because all 4 cases were clearly symptomatic, including 1 patient who was more than 6 years into the disease course when molecular imaging was obtained. These PiB-PET findings stand in stark contrast to the intense uptake on tau-PET imaging, with the global spatial distribution mirroring that seen in AD (figure 2). This distribution does not follow the known distribution of the PrP plaques and, therefore, this does not represent off-target binding of PrP plaques. The magnitude seen in these familial prion cases is similar to that seen in individuals with young-onset AD dementia, which supports the possibility that the tau-PET binding seen in these cases is related to the known NFT pathology that occurs in this family. Although, this would need to be confirmed by future pathologic evaluations, the finding suggests good sensitivity and specificity for AD-like tau aggregations. In vivo detection of molecular hallmarks of neurodegenerative diseases will be a prerequisite to well-conducted therapeutic trials. Not only will such biomarkers be able to assess whether the pathology of interest is actually present, but these molecular PET biomarkers also have the potential to objectively index disease severity and response to therapeutic intervention. Understanding the in vivo behavior of these PET biomarkers under various neurodegenerative circumstances is imperative to their proper use in clinical trials and research studies on the basic neurobiology of neurodegeneration. This study demonstrates neocortical AV-1451 binding of presumed AD-like NFT and the lack of PiB binding to PrP plaques in this kindred. Although the spatiotemporal dynamics of how this pathology evolves across the neocortex in this kindred remains unknown, future longitudinal tau-PET studies of symptomatic and asymptomatic individuals will be able to address this question directly. D.T. Jones: acquisition of data, analysis and interpretation of data, and manuscript preparation. R.A. Townley, J. Graff-Radford, H. Botha, D.S. Knopman, R.C. Petersen, C.R. Jack, V.J. Lowe, and B.F. Boeve: acquisition of data, analysis and interpretation of data, and critical revision of the manuscript for intellectual content. This research was supported by NIH grants R01 AG011378, R01 AG041581, U01 AG006786, P50 AG016574, The Liston Family Foundation, The GHR Foundation, Foundation Dr. Corinne Schuler, the Mayo Foundation, and by the Robert H. and Clarice Smith and Abigail van Buren Alzheimer's Disease Research Program. D.T. Jones, R.A. Townley, J. Graff-Radford, and H. Botha report no disclosures. D.S. Knopman receives research support from the NIH and the Robert H. and Clarice Smith and Abigail Van Buren Alzheimer's Disease Research Program of the Mayo Foundation; he serves on a Data Safety Monitoring Board for Lundbeck Pharmaceuticals and for the DIAN study; and is an investigator for clinical trials sponsored by Biogen, TauRX Pharmaceuticals, Lilly Pharmaceuticals, and the Alzheimer's Disease Treatment and Research Institute, University of Southern California. R.C. Petersen serves on data monitoring committees for Pfizer Inc and Janssen Alzheimer Immunotherapy; works as a consultant for Merck Inc, Roche Inc, Biogen Inc, Eli Lilly and Company, and Genentech Inc; receives publishing royalties for Mild Cognitive Impairment (Oxford University Press, 2003); and receives research support from the NIH and the Robert H. and Clarice Smith and Abigail Van Buren Alzheimer's Disease Research Program of the Mayo Foundation. C.R. Jack receives research funding from the NIH and the Alexander Family Alzheimer's Disease Research Professorship at Mayo Clinic. V.J. Lowe is a consultant for Bayer Schering Pharma, Merck Research, and Piramal Imaging Inc and receives research support from GE Healthcare, Siemens Molecular Imaging, AVID Radiopharmaceuticals, the NIH (NIA, NCI), the Elsie and Marvin Dekelboum Family Foundation, the Liston Family Foundation, and the MN Partnership for Biotechnology and Medical Genomics. B.F. Boeve served as an investigator for clinical trials sponsored by GE Healthcare and FORUM Pharmaceuticals. He receives royalties from the publication of a book entitled Behavioral Neurology of Dementia (Cambridge Medicine, 2009). He serves on the scientific advisory board of the Tau Consortium. He has consulted for Isis Pharmaceuticals. He receives research support from the NIH, the Robert H. and Clarice Smith and Abigail Van Buren Alzheimer's Disease Research Program of the Mayo Foundation, and the Mangurian Foundation. Full disclosure form information provided by the authors is available with the full text of this article at Neurology.org/NG. The authors greatly thank AVID Radiopharmaceuticals, Inc., for their support in supplying 18F-AV-1451 precursor, chemistry production advice and oversight, and FDA regulatory cross-filing permission and documentation needed for this work. The authors are particularly grateful to our patients and the extended family for participating in this research.
. The genetics of prion diseases. Genet Med 2010;12:187–195.
. Clinical characterization of a kindred with a novel 12-octapeptide repeat insertion in the prion protein gene. Arch Neurol 2011;68:1165–1170.
. Hyperphosphorylated tau deposition parallels prion protein burden in a case of Gerstmann-Straussler-Scheinker syndrome P102L mutation complicated with dementia. Acta Neuropathol 2002;104:342–350.
. Familial prion disease with Alzheimer disease-like tau pathology and clinical phenotype. Ann Neurol 2011;69:712–720.
. Neurofibrillary tangles in Gerstmann-Straussler-Scheinker syndrome with the A117V prion gene mutation. J Neurol Neurosurg Psychiatry 1997;63:240–246.
. An autoradiographic evaluation of AV-1451 Tau PET in dementia. Acta Neuropathol Commun 2016;4:58.
. In vivo (18)F-AV-1451 tau PET signal in MAPT mutation carriers varies by expected tau isoforms. Neurology 2018;90:e947–e954.
. [(18)F]T807, a novel tau positron emission tomography imaging agent for Alzheimer's disease. Alzheimers Dement 2013;9:666–676.
. Imaging brain amyloid in Alzheimer's disease with Pittsburgh Compound-B. Ann Neurol 2004;55:306–319.